In the wake of the international community’s agreement to end the supervised independence of Kosovo, the United States of America today expressed its commitment to the country’s EU aspirations. In his remarks with President Jahjaga of Kosovo following thheir Meeting, Assistant Secretary Philip H. Gordon for Bureau of European and Eurasian Affairs in Pristina, Kosovo, says the international community believes that Kosovo has made enormous progress in the four and a half years since your independence. The Yugoslav Army withdrawing from Kosovo, handing over total control of the province to the Kosovo Force. 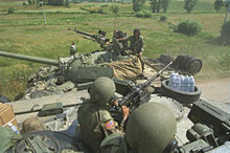 Pictured, US Army M1 Abrams passing a Yugoslav Tank. He cites that he was able to convey the message to Belgrade thatthe United States continues to strongly support Kosovo’s sovereignty and territorial independence. The US believes that whatever government is formed in Belgrade it should fully implement the agreements that have been reached in the dialogue so far, and carry on with that dialogue in whatever form is necessary to reach the practical agreements that will help improve the lives of people on both sides of the border. He states that the US government hopes that Serbia remains on course towards European Union membership. Mr. Gordon pointed our that European colleagues have made clear, the membership requires it initially to normalize its relations with Kosovo. He stresses that the US government will play whatever role it can in supporting relations between those two countries. Mr. Gordon says he was encouraged to hear from the President, just as I heard from the Prime Minister in Dubrovnik about plans in Pristina to increase outreach in the north of Kosovo. Both the United States and Kosovo deplore the acts of those who are trying to stand in the way of such outreach and of the desire of what we believe to be most of the citizens – Serb, Albanian and others – to live in peace and security, Mr. Gordon highlighted. Mr. Gordon also complimented the President on her efforts to advance their common goals on the issues which include fighting corruption. At a Security Council Open Debate on Kosovo at New Yorkin May this year, the United States underscored that Kosovo is making good progress on eoad to European integration. In his remarks at New York, U.S. Ambassador and Alternate Representative for Special Political Affairs Jeffrey DeLaurentis said the United States welcomes the peaceful participation by dual nationals in Serbian presidential and parliamentary elections in Kosovo on May 6. The United States is looking forward to an equally incident-free second round on May 20. Kosovo’s and Serbia’s coordination with the OSCE allowed dual nationals to exercise their right to vote without infringing on Kosovo’s sovereignty, demonstrated how both countries can effectively work with the international community to overcome political differences. The United States is hopeful that both governments will use this practical approach to discuss ongoing problems in northern Kosovo over the coming months. The United States also welcomes that Serbian authorities dismissed as illegitimate local elections held in northern Kosovo. The United States continues to reject any action that would undermine Kosovo’s independence, sovereignty and territorial integrity. The United States stands with the international community in our commitment to long-term peace and stability for Kosovo and for the entire Balkan region. The United States consider Kosovo’s progress towards developing a plan to implement Resolution 1325 on women, peace and security is but one example of how seriously Kosovo is taking its obligations as a sovereign state and responsible member of the international community. The United States is looking forward to seeing both Serbia and Kosovo continue on their paths toward full cooperation and European and Euro-Atlantic integration. In February this year, Serbia and Kosovo reached an important agreement at EU-facilitated Dialogue that will pave the way for Serbia’s gaining official “candidate” status to join the European Union. The agreement underlines conditions under which Kosovo can be represented at regional fora and a technical protocol on Integrated Border Management. Kosovo is given the chance to sit at the table in regional fora as an equal partner, representing and speaking for itself. The United States supports the aspirations of both countries to achieve lasting peace and prosperity and to complete their European integration. On September 2011, Serbia’s President today told the General Assembly’s annual general debate that Serbia cannot accept Kosovo’s unilateral declaration of independence. President Boris Tadic stressed that it will also not abandon the negotiations process between Belgrade and Pristina. Kosovo declared independence from Serbia in February 2008, but Serbia does not recognize the declaration.